Looking for the perfect waffle recipe? 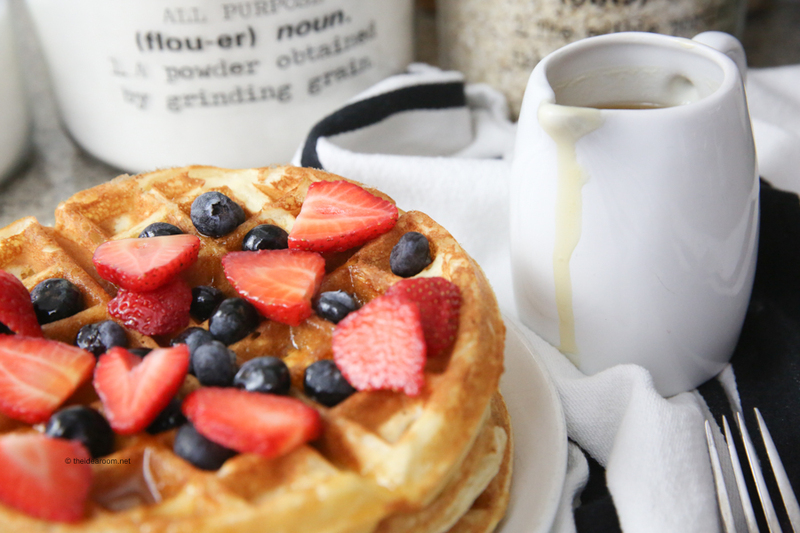 Check out our waffle recipe. Crisp on the outside and light and fluffy on the inside! The whole family will love them! This is one of our ver favorite go-to breakfast recipes! I tend to make it when we have a lazy weekend morning and when all of the kids are home to eat them. They are always welcomed with a little cheer when the kids wake up to the smell of the waffles cooking in the waffle iron. We love to serve them with some fresh fruit and whipping cream and smothered with our very favorite Buttermilk Syrup. To grab that recipe, click on the link here. We also love to grab some frozen peaches out of the freezer (which have been cut up and frozen from fresh peaches in the fall) and slowly warm them in a saucepan on the stove top while the waffles are cooking! It’s so delicious! This recipe calls for buttermilk which I personally love. The buttermilk adds a little bit of tanginess to the flavor which isn’t overpowering, but gives it a nice taste. I don’t usually keep buttermilk on hand and have found that you can make your own “buttermilk” but adding a TBSP of white vinegar or lemon juice to your 2 cups of milk. Just let it sit for 15 minutes or until the milk is a little curdled. This creates a great and easy substitute that you will always have on hand! 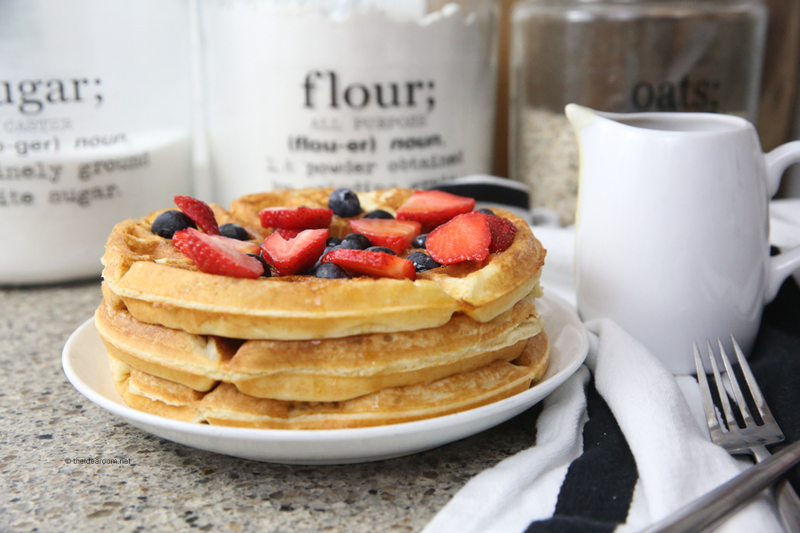 Use our waffle recipe to make the best waffles for you family! Read the directions before starting so you know what steps need to be taken. If you want really fluffy waffles be sure to follow the directions when adding the eggs. This will give you the best results if you have the time. The waffles still turn out pretty tasty and fluffy when you just add the eggs without separating the egg yolk and the whites. Add the vegetable oil to the dry ingredients. Add the buttermilk or make your own buttermilk substitute. (Make a buttermilk substitute by adding 1 TBSP of white vinegar or lemon juice to your milk and let it sit for 15 minutes before adding it to the dry ingredients). Add the vanilla and then mix the dry and wet ingredients to just barely mixed. Add the eggs. If you want the waffles to be extra fluffy and you have the time, separate the eggs into egg whites and yolks in separate bowls. 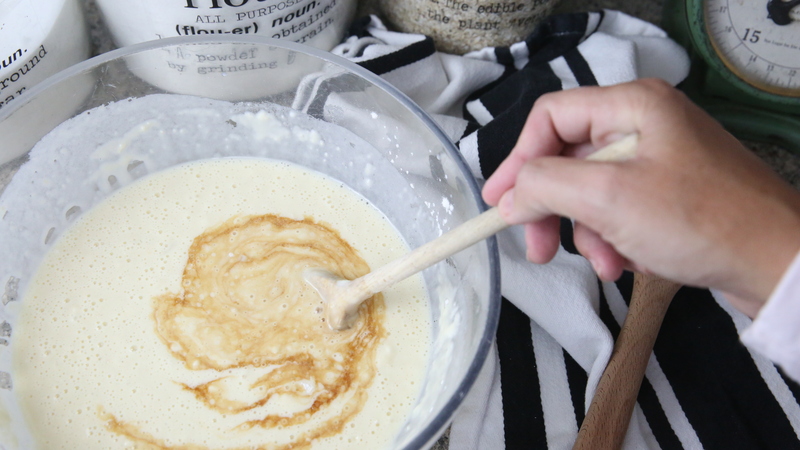 Beat the egg yolks and then mix them into the batter. Beat the egg whites until stiff peaks form and then gently fold the eggs into the batter. Makes about 16 regular sized waffles. 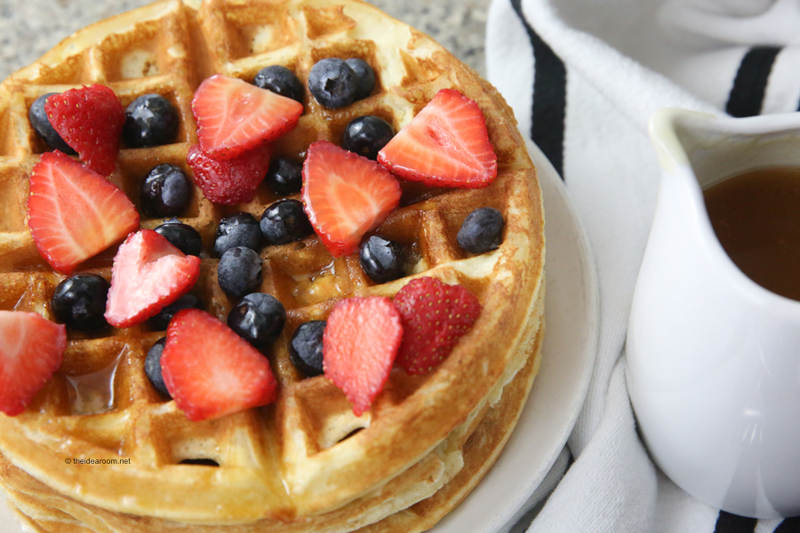 Learn how to make our waffle recipe with our easy to follow waffle recipe video. In this video we made them the quick and easy way and they turn out pretty fabulous. Want to make them even better? Read the directions in the recipe to learn how to make them a little more fluffy by separating the egg yolk and egg whites and then adding them to the batter and beating them. 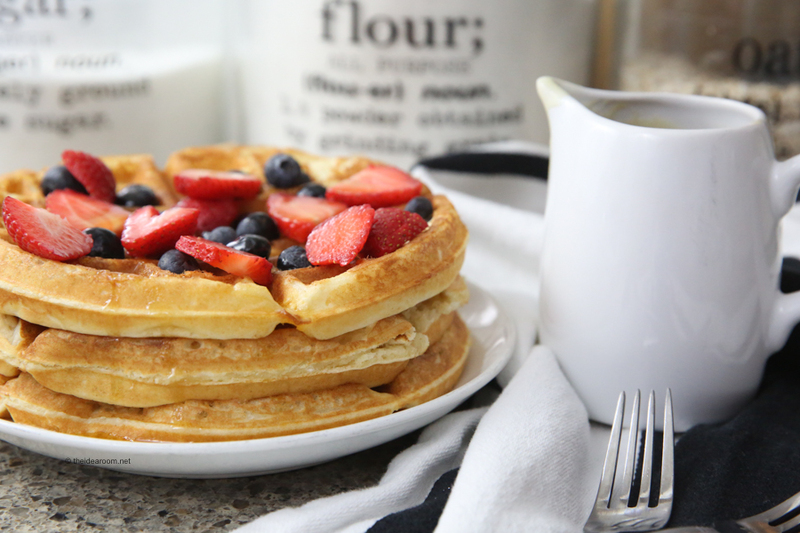 Either way you make these waffles, they turn out great! If I am short on time, which we usually are in the mornings, I tend to skip the extra fluffing part! Feel free to do it if you want extra fluffy waffles and have a little extra time. Read your waffle maker manual. Be sure to read the instruction manual for your specific waffle maker. All waffle makers are not the same! Most of us just take the waffle iron out of the box, wash it and turn it on and go! Reading the manual can help you cook a better waffle. Non-stick waffle makers may not need spray oil. The amount of oil or butter in your batter will determine whether or not your waffles stick to your waffle maker. 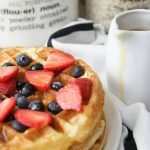 If your waffles are constantly sticking and your waffle maker is a non-stick version that doesn’t require spraying with oil before using, increase the level of oil a little bit in your recipe. If you bought your waffle maker within the last 5 years, you will most likely not need to use any extra oil. When adding the egg, separate the egg yolk from the whites. The key to a light and fluffy waffle in the middle is achieved by separating the egg when adding it to the batter. Separate the egg and beat the yolk separately. Add the beaten yolks to the wet ingredients of your batter. Take the egg whites and separately beat them until stiff peaks form. Fold the eggs whites gently into the final batter using a spatula. Do NOT mix well. Waffle batter is a tricky. It should be smooth enough to flow freely through the dimples of the waffle plate, but it should never be over-mixed. Using a rubber spatula, mix the wet ingredients of your batter into the dry ingredients. Using a gentle motion and a couple extra minutes, mix the batter until smooth. Use buttermilk or a buttermilk substitute. Regular milk can be used in place of buttermilk but will give your waffles a little different taste in terms of tanginess. If you don’t have buttermilk on hand you can make some really easily by adding a TBSP of vinegar or lemon juice to your cup of milk. Let it set for 15 minutes to allow the acid to curdle the milk. This will give you the effect and the difference in taste you are looking for. Do NOT open the waffle maker until your indicator light tells you the waffle is ready. As a general rule you should always wait until your waffle maker says it’s okay, by way of its indicator light or beeping mechanism. Lifting the lid too soon could cause your waffle to rip, leaving one poor half of a waffle stuck to the top and the other half stuck to the bottom. This will immediately deflate your waffle creating a less than desirable puffy waffle. Keep waffles warming so everyone can eat at the same time. If you’re cooking for more than one person, you’ll probably want everyone to eat at the same time, but most waffle makers make one at a time. To serve waffles to your family at the same time while the waffles are warm and delicious, simply set your oven to 250 degrees. As you finish with each waffle have a helper move them right to a pan of waffles staying warm in the oven. A short time in the oven can actually improve the crispness of a waffle. Then serve all of the warm waffles at the same time to everyone! Freeze left over waffles. 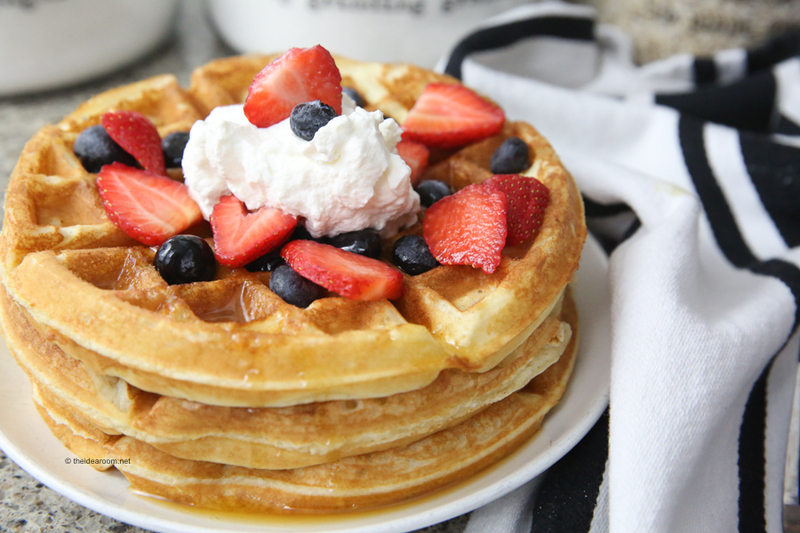 If you have extra waffles leftover (who does that? ), just place them in a freezer bag after they’ve cooled. Place wax paper between multiple waffles and squeeze as much air from the bag as possible. When you’re ready to eat them, set out the preferred number of waffles and let them defrost for about 10 minutes. Then, heat the waffles in your oven at 300 degrees for about 5 minutes or pop them into the toaster for a quick breakfast. Clean your waffle iron while it is still warm. If you clean your waffle maker shortly after it’s cooled to the touch, you are going to thank me and have a lot less work to get it clean…especially if you tend to be an over pourer like myself! This is how I have learned this tip! You are welcome! Soften your butter before serving. Always have softened butter or margarine and warmed and your syrup ready for your waffles. There’s nothing worse than ripping your perfect waffle while trying to spread hard butter over it. You can also melt a little butter in a syrup pitcher to pour some melty goodness on your waffle! Thanks for stopping by! I hope you enjoy your waffles! I have been using a waffle recipe very close to this one for the last couple of years. So I’m excited to try yours and take my waffles up a notch. My tip for cleaning the waffle maker, soak a couple of paper towels in water and wring them out so they are quite damp, place in cooling unplugged waffle iron and shut the top. 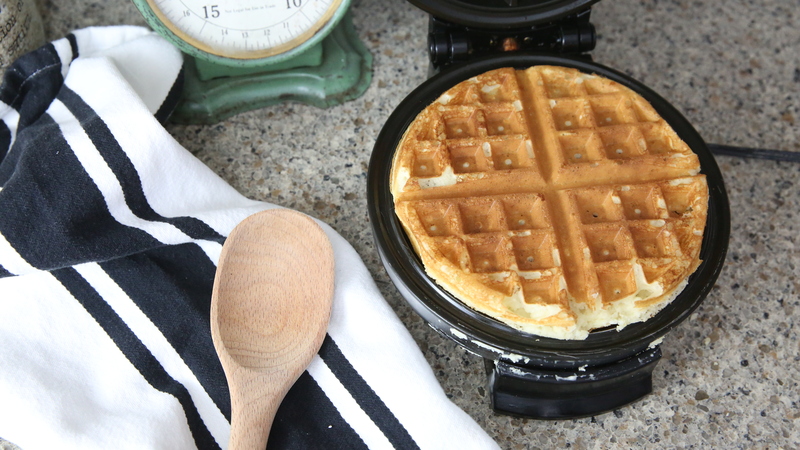 The heat from the waffle iron will turn the moisture in the paper towel to stream and virtually steam clean your waffle maker while it’s cooling. Robin- Great tip! Thank you for sharing. I will have to try that out!